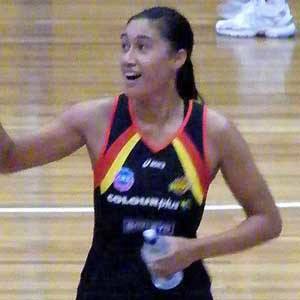 Netball goal attack and goal shooter who won gold at the Commonwealth Games in 2006 and 2010 and silver in the 2007 Netball World Championships. She attended Mount Albert Grammar School in Auckland. She won gold at the 2007 World Netball Series. She grew up in Tokoroa, New Zealand. She got engaged to Israel Folau in October 2016 and they later married. Rugby fly-half Quade Cooper was also raised in Tokoroa.